Blaming all comfort complaints on HVAC “Usual Suspects” can lead to wrong actions, a broken automation framework and ever more complaining and energy waste. A better approach is to open your inquiry to more of what’s happening across the whole building, using analytics to reveal anomalies and correlations among a wider array of time-series data streams. “Round up the usual suspects,” is one of the classic quotes from the 1942 film Casablanca. When this phrase is muttered as the plan of action, you’re far from the truth. The 1995 crime thriller ‘The Usual Suspects’ picked up on that thought and built it into one of the most twisted plots of all time. 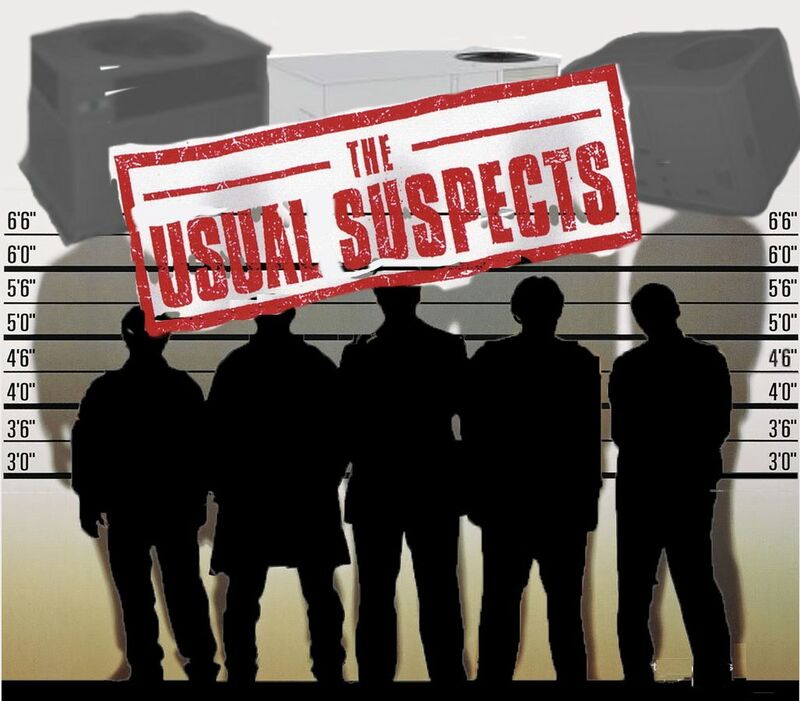 Like the collection of criminals who meet in the movie’s police lineup, HVAC equipment has been an easy target of blame. Hot and cold calls have been the most common type of occupant comfort complaint in large commercial buildings for about as long as people have been watching 1942’s Casablanca. “All complaints have always rolled up to temperature as the common denominator and to the HVAC system as culprit,” observes Matt Schwartz, Commissioning Engineer with Altura Associates. This is finally changing due to data analytics. “Thermal comfort depends on the individual as much as it does the HVAC. When building staff is coerced into adjusting temperature to the satisfaction of the squeakiest wheel, it often sets off a downward cycle for the calibration of the whole building. When you override HVAC tooling, you are often stealing capacity from one system to deliver to another or asking the system to operate outside of it’s basis of design. The root of the problem may be vents blocked by partitions, windows with no thermal barriers, the need to change seating–or some people should just consider a sweater,” says Schwartz. Altura is one of the new breed of energy management consultancies that have expertise and passion for building operational analytics. Enterprises with big real estate portfolios and whose business value derives from interior comfort — hotels, hospitals, schools, offices — are looking to such firms to move their buildings staff beyond ‘usual suspects’ thinking. As John Davies, Greenbiz.com research analyst noted in a recent webcast, the hotel industry has been far ahead of other industries in using data analytics for purposes other than energy performance monitoring. That webcast brought together the sustainability and building operations chiefs from MGM Hotels along with peers from Intel and Siemens, the latter two working for companies now in the building energy management solution business. Operator mentality becomes a bigger issue! Operators are told that occupant comfort is number one priority so they are quick to move a setpoint in the absence of good analytics to indicate whether ambient temperature is truly the culprit. This accounts for major drift even in recently commissioned facilities. Also, until now, they have not had many options other than changing ambient temperature in their comfort-delivering arsenal. Office furniture that delivers heating and cooling to the complaining executive, such as that under development by Personal Comfort Systems, might be another way to deliver satisfaction — without causing the whole building to drift out of calibration. Greenbiz’ Davies cued up his analytics discussion by asking the panel whether they were satisfied with the quantity and quality of the data they were gathering from sensor networks in their large building portfolios. The panelists were quick to point out that quantity was certainly not an issue, but there were hurdles to getting to actionable information and to always being confident that limited dollars and staff resources are being spent on the most impactful projects. MGM’s Chris Magee and Intel’s Marty Sedler, Director of Global Utilities & Infrastructure, concurred that building automation systems offered a daunting number of potential collection points. The problem is managing all the data. “We start by ensuring that our automation framework is built upon an open architecture,” explained Magee. This enables MGM to pull in data in any format and to normalize it to do the customization that will allow apples-to-apples viewing in energy, financial or carbon equivalents terms. “If it’s about managing a cooling tower asset, for example, the operator should know what those values are in real-time to understand the implications of the unloading and loading of chillers.” The panel also concurred that their own building staff often doesn’t have the expertise or the passionate interest in data normalization and analyzing tasks to get to this point. “Someone helping remotely is another ingredient that we support. We’re looking for strong, long-term partners in this role,” said Magee.